Guys, I tried. I did. I tried to write a review of Star Wars: The Force Awakens without posting spoilers, because posting spoilers on the Internet is the path to the Dark Side. I thought I could be vague (“There’s a thing that happens and it’s amazing!”) and still get most of my pertinent feels across. But…I can’t. I thought I could, but I can’t. So if you haven’t seen The Force Awakens yet, please — and I really can’t emphasize this enough, because this is a movie that deserves to be viewed completely unspoiled* — STOP. READING. This is not the spoiler-free review you’re looking for. *I don’t care if you think you don’t mind spoilers, just this once, you should care. Okay, so if you’re reading this, you’ve already seen the movie, right? RIGHT? *looks around* So now there shouldn’t be anybody left that hasn’t seen Episode VII. If you haven’t seen it and you keep reading, that’s not my fault. Your fault. Not my fault. Got it? Cool. STAR WARS, GUYS, I CANNOT EVEN, CAN YOU EVEN? NO? GOOD BECAUSE I CANNOT EITHER. Seriously, despite being One of Those People who teared up at every single trailer (how could you not at “Chewie, we’re home”? ), and despite being an unapologetic Fan of J.J. Abrams (say what you will about the endings of LOST and Alias or Star Trek Into Darkness; the man knows how to begin things), I was not prepared for how much I loved The Force Awakens. I was ready to love the characters from the Original Trilogy, but I’d figured the others would require a warming period. After all, I’ve loved the Original Trilogy my entire life. I have three decades worth of emotional investment in these characters. How could the new blood possibly measure up? Oh, how gloriously wrong I was. So let’s take them one at a time, in the order they are introduced, shall we? I was surprised that Poe is the first major character we meet. Based on the trailers, I thought it would be Rey, or possibly Finn. I also didn’t expect to have all that many feelings about him. But in just a few minutes of screen time, I was solidly Team Poe. His first line when he comes face to, er, mask with Kylo Ren endeared him to me forever. (“Do I talk first or you talk first? I talk first?”) Everything about Poe Dameron was utter perfection, from his clear affection for BB-8 (another surprise! I’d been all prepared for the Rey-BB-8 buddy show, but much as R2’s loyalty was to Luke, BB-8’s metal heart belongs to Poe Dameron) to his affable swagger when he teams up with Finn (“I can fly anything”) to his triumphant return later in the movie and his elated hug with Finn when they realize the other is still alive. Let’s just dwell on that hug for a second. Poe and Finn had met exactly once, and while Finn latching on to Poe as his BFF is semi-understandable since Finn was a brainwashed Stormtrooper and had exactly zero friends, Poe is a charismatic guy with, presumably, other people he cares about, and who care about him. (Granted, probably a lot of them died in that opening scene, but hopefully not all of them.) And yet he is so elated to see Finn alive. It warmed my heart to see him care so genuinely and deeply about poor displaced Finn, and I am now significantly hopeful that a good chunk of Episode VIII will include The Broscapades of Finn and Poe. First, let’s just get out of the way how utterly adorable the bond between BB-8 and Poe is. When Leia entrusted R2-D2 with her message for Obi-Wan in A New Hope, she was all business. There was no affection between her and the droid (C-3P0 didn’t even really know who Leia was, other than that she was a figure “of some importance”), and it wasn’t until R2 delivered his message to Obi-Wan and Luke that we really saw an emotional bond begin to form. But The Force Awakens puts the human-droid bond front and center, with Poe literally tearing up as he gives vital information to BB-8 and tells him to get as far away as possible, then promises, “I will find you.” (Dangit, now I’m getting emotional about Poe again, and I’m supposed to be talking about BB-8.) But I thought this was an excellent way to get the audience immediately invested in this new droid (I can’t have been the only one highly skeptical about a new cutesy addition to the Star Wars-verse, right? ), since if Poe Dameron cares so deeply about him, and Poe Dameron is so clearly awesome, then surely I should care about him too. And it didn’t take long for BB-8 to establish himself as worthy of that emotional investment. From the delightful physical gags (how a bike helmet on a beach ball managed to give a thumbs up was one of the funniest visuals of the movie) to his sassy personality (sure, we can’t understand him, but Rey can, and watching her react was enough), BB-8 quickly proved that not only did he deserve his place beside R2 and C-3P0 as one of the most beloved droids in Star Wars, but he might…actually…be my new favorite? I am so excited about Kylo Ren, guys. Until now, Star Wars has given us a very clear line between the Light and Dark sides of the Force. Even Luke and Anakin/Vader, the only truly conflicted characters, tended to not straddle the line so much as pole-vault across it when it served their purpose. But Kylo! He is something we haven’t seen before. A character who actively chose the Dark Side but is tempted by the Light. A character estranged from his parents (no one was really surprised to find that Kylo Ren — formerly one Ben Solo — was Han and Leia’s son, right? ), pressured by his father to turn away from what he knows and give into temptation — but in the opposite way of how we’ve seen this play out before. I’d like to thank J.J. Abrams, along with whoever else was responsible for casting, for bringing John Boyega into the Star Wars-verse. From surprising fans at Star Wars screenings to freaking out on his first viewing of the Force Awakens trailer to just being genuinely classy in the face of some genuinely unclassy comments about his casting, he’s just been a real treat to watch and I’m glad that Star Wars brought him onto my radar. But I’m not here to talk about John Boyega. I’m here to talk about Finn. Finn. Admittedly, we don’t get a ton of backstory on Finn (which is nothing new for Star Wars; the Original Trilogy gave us practically nothing on the Main Trio), but what we do know — taken from his family at an age so young he doesn’t remember them, trained as a soldier, treated as a slave, “conditioned” not to have any thoughts of his own — makes him even more interesting. When we see the Stormtroopers burning Poe’s village to the ground, Finn is the only one hesitates to kill the innocent civilians. Finn is the only one visibly shaken by the death of his comrades (perhaps even friends?). Finn is also the only Stormtrooper in the entire series to willingly remove his helmet (correct me if I’m wrong, as I’ve purposely blocked out the prequels, but in the Original Trilogy, the only helmets we see removed are worn by Luke and Han). What is it about him that allows him to break free? Could it be…a capacity for the Force? Or is Finn just an innately good person, and that goodness couldn’t be wiped out of him, no matter how much First Order conditioning he received? Surely his line when he rescues Poe — “It’s the right thing to do” — shows his strength of character (where did he even learn the difference between right and wrong during his conditioning?). Despite Finn’s struggle throughout the movie between taking care of himself and taking care of his new friends, nothing highlights that inner strength more than at the end when he takes up Luke’s lightsaber(!) and battles (!) Kylo Ren(!!!). Compared to how flashy and over-choreographed the prequel lightsaber battles were, can I just tell you how much I loved how raw the fights were in The Force Awakens? You have Kylo — a partially trained Jedi with a serious temper problem — and Finn, a former Stormtrooper who knows his way around a blaster, but has never trained with any other form of weaponry, just flailing madly at each other. It’s not polished, it’s not pretty, but it is amazing. Never before have any of the other Star Wars movies ever driven home the pure brutality of these weapons, but in this fight we have sizzling snow and smoldering garments and burned flesh. Even when Vader was lopping off Luke’s hand in Empire, it was all very clean and precise, but this fight was messy. And so when Finn loses — Finn loses — it hurts. It hurts him, and it hurts us, because we saw how much effort that battle took, how scared he was, how far out of his league, but how he kept fighting a losing battle because it was the right thing to do. Can we just…take a moment and bask in the glory that is Rey? I was not prepared for how much I loved Rey (and how much I loved Daisy Ridley as Rey. It reminded me of the feeling I had watching Keira Knightley as Elizabeth Swann in the first Pirates of the Caribbean film, another character I was not prepared to love half as much as I did/do, and how even though I’d only seen her in the one movie, I was now willing to follow her to every movie ever). Every time I thought, okay, this is it, I love her as much as I possibly can, the movie would give us something else to love. The entire sequence where she meets Finn, from her knocking out her assailants before Finn can “rescue” her, to her constant “I know how to run without you holding my hand!” protests, to her reluctance to steal the “garbage” Millennium Falcon, followed by her surprise!ability to pilot the Millennium Falcon, was pure gold. And then I could take you through all the best Rey moments in the rest of the movie, but I won’t, because that’s like the entire movie? Every single scene she was in was magical. When she taught herself to use the Force on the Stormtrooper? When Luke’s lightsaber flew past Kylo into her hand? When she met Leia’s eyes and went straight into her arms without ever meeting her (IN THIS MOVIE, ANYWAY)? When it was just understood that the Falcon was hers now, and Chewie was her new co-pilot, and she found Luke and held out the lightsaber and a world of understanding passed between them? Suffice it to say that Rey is a phenomenal character to hang this new franchise on, and I can’t wait to see the rest of her journey. I don’t want to say I was worried about seeing Han, Leia, Chewie, C-3P0, R2-D2, and Luke again. I wasn’t. I was actually overjoyed to see them again. But I worried a bit that they’d feel shoehorned into the new story, that their inclusion would wind up feeling more sad than triumphant, that they’d feel peripheral to the main plot. I was so wrong. I was so pleased with how the old and new wove together seamlessly. I loved that we are not dealing just with “the next generation” in terms of age, but with the literal next generation of these characters, since Kylo is Han and Leia’s offspring. Not only did they fit in this story, but this story could not have existed without them. But at the same time, the new characters were allowed to carry most of the weight. That is no small feat, and I was so, so impressed with how they pulled it off. I’ve rarely (right now, I’d say never, but I could probably think of something if I gave myself enough time to think about it) seen such a smooth passing of the torch in a franchise. I loved the little ways they aged up the characters. Han and Leia, being human, aged more obviously, but they also gave us C-3P0’s red arm (“You probably don’t recognize me.”), and even Chewie has become a bit of a crotchety old man. I was nervous about Mark Hamill, having just seen him as The Trickster on The Flash, where he was looking markedly un-Jedi-like, but I thought he pulled off the Force Hermit look well. I do wish we’d gotten at least one line out of him, but with Han gone, I’m guessing Episode VIII will be the Luke and Rey show. Guys, I know, I know, I am as devastated as you are, but Han had to die. Not just because Harrison Ford has wanted him dead for 30 years, but because this is not Han’s story. It never was, really. It was always Luke’s story. Han arguably had a small arc in the original trilogy — he went from being someone who was only out to save his own skin to someone who would risk himself to save his friends — but Star Wars has never been about Han Solo. At its core, one of the central conflicts of Star Wars has always been about identity, and the struggle between who you think you are vs. who others want you to be. Han Solo has always had a firm grasp on who he is and what he wants, and that hasn’t changed throughout the entire saga. But by killing Han Solo off — killing him at the hand of his son, so that he can complete his transition to the Dark Side — we’ve once again put that central conflict of identity front and center. Because it’s not about Han, it’s about Kylo. Who Kylo wants to be versus who Han still hopes he is. It’s that pivotal Luke Skywalker choice all over again, but flipped, and it is even more gutting than Luke’s original confrontation with Vader, because when Kylo triumphs over his father, it’s not what we want at all. For so much of this movie, we were lulled into believing that if Rey is this generation’s Luke, Kylo is Vader, but that’s not the case. They’re both Luke — one as we know him, the other as he could have been. And this choice — for Kylo to kill Han as Rey looks on, horrified — drives that parallel home. So much of The Force Awakens was re-treading familiar ground, but Han’s death sets the story on a new path we haven’t been down before. What if Luke gave in to the emperor’s taunts and struck down his father? What if, despite the part of him that still felt pulled toward the Light Side, he chose the Dark? What if, instead of balancing on that line, he toppled over it? Could he ever climb back to the other side? Would we even want him to? Han: [taking Kylo’s hand] Your mother and I…we love you. Kylo: [tears in his eyes] I know. WHY DID THIS NOT HAPPEN? I can only imagine it’s because they’re saving the “I love you”/”I know” exchange for Leia/Kylo in a future installment. Because if this franchise does not give me the Solo Family turning that iconic endearment from an expression of romantic love into one of familial love, I just don’t even understand what I’m doing here. ETA: Also! I just want to point out the beautiful symmetry between how we meet Han in A New Hope and how he leaves in The Force Awakens. The first time we see him, after he’s finished wheeling and dealing with Obi-Wan, is when he’s confronted by Greedo, and Han — as all true Star Wars fans can attest — shoots first. It’s Han on the offensive, acting before anyone else can, motivated by a strong sense of self-preservation. But in his last scene, his death is the direct result of Han deliberately choosing not to act. Han Solo has finally found something he cares about more than himself, and he is willing to forego that self-preservation instinct — to go as far as having a weapon placed in his hand and still not using it — if there’s a chance it might save his son. Like so much else surrounding Kylo Ren, this scene mirrors that first one, but takes it in the opposite way of what we’ve seen before. I thought it was a brilliant, moving way to say goodbye to this beloved character, and highlighted the character growth in Han that’s been happening off-screen for the past 30 years. 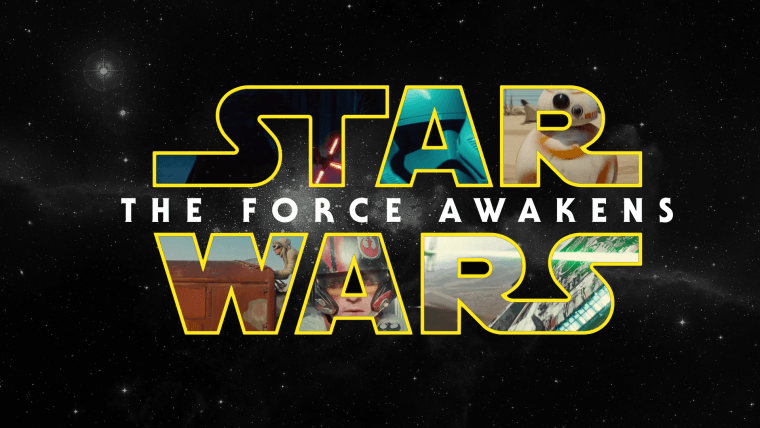 So there are (most of) my spoilerific thoughts on The Force Awakens! (There are more, but this post is already a dissertation.) What were your favorite parts? Who was your favorite character? I can discuss this forever, so please, if I forgot to mention something awesome, LET ME KNOW. ETA: Rey is totally Luke’s daughter, right? 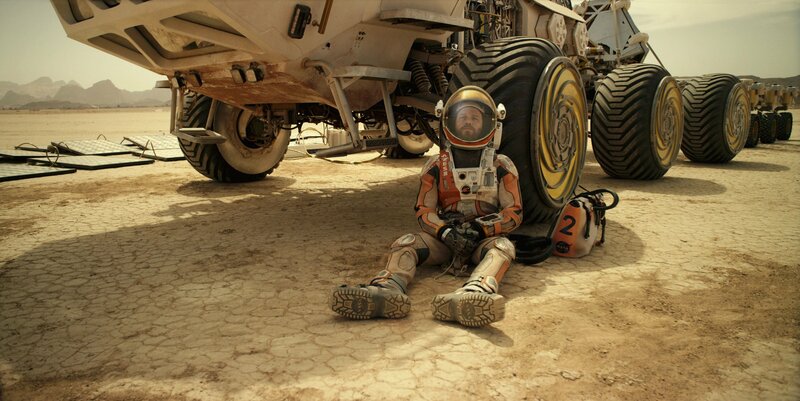 A few weeks ago, the trailer for the upcoming sci-fi film The Martian released online. Look, here it is. Watch it. I’ll wait. Looks pretty great, right? I saw it was based on a book. “Should I read the book?” I wondered aloud on social media. Okay, I thought. It had been a while since I’d read any adult sci-fi that really engaged me as a reader, and I was way overdue for something good. So I ordered the book, and waited eagerly for its arrival. THE MARTIAN is, hands-down, one of the best books I’ve ever read. I don’t mean “best” in a technical sense — although I don’t think it has many faults in that arena either — but in a couldn’t-put-it-down, laughed-out-loud, recommended-it-to-everyone-I-knew, still-thinking-about-it-weeks-later sense. I loved it so much it’s hard to write a review without devolving into incoherent squealing noises, but I shall try. The appeal of THE MARTIAN hinges almost entirely on its main character, Mark Watney. The vast majority of the book is his first-person journal entries, where he describes his efforts to survive alone on a hostile planet, for years, using accommodations and supplies meant to last a month. This is a dangerous device, because if the reader doesn’t like the main character, there’s literally nothing else to focus on. Mark is it, at least for the first significant chunk of the book. Take him or leave him. Fortunately, Mark Watney is the kind of character I could read forever. Though most of his narration is spent breaking down the science of survival (soil cultivation! structural engineering! making water out of rocket fuel! ), which sounds like it should be the most tedious of subjects, I was riveted from the first page to the last. He had a way of describing even the most complex processes in ways that were not only easy to follow, but exciting and, against all odds, funny. Never in my life would I have thought I could be so invested in potato farming, or laugh so hard at the woes of a man caught in such dire circumstances. There are no bad guys in THE MARTIAN, and it doesn’t need any. There is only Mark (and, eventually, NASA) versus Mars. Since Mars is always present, and always deadly, the tension stays ratcheted up throughout. Life on Mars may be monotonous for Mark, but for the reader, there are no dull points. Everything Mark does is a matter of life and death, all told through a lens of determination, scrappiness, and wry (occasionally profane) humor. 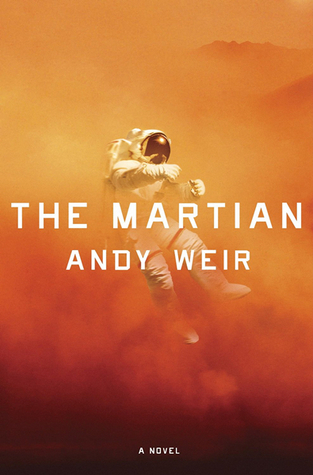 Science is practically a main character in THE MARTIAN, but author Andy Weir — through Mark — breaks it down into language that was completely accessible to me, a total layman. Even though practically every page contains Mark working through calculations, conducting chemistry experiments, or engineering unorthodox solutions to his problems, the narrative never felt bogged down by it, nor was I ever confused. Everything from the technology to Mark’s methods to NASA’s reactions were all presented in such a compelling and believable way that I occasionally had to remind myself that this was science fiction, not a true story. 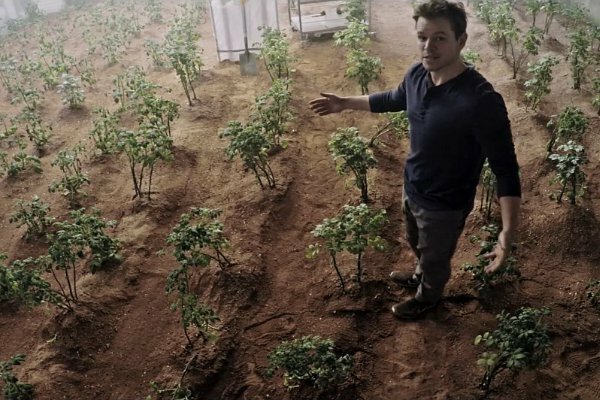 THE MARTIAN is everything I want in science fiction. High stakes, excellent pacing, unexpected humor, an amazing premise, smart yet accessible science, and fully realized characters that I miss once the last page is turned. It easily launched itself to the top of my list of favorite books, and is a story I look forward to re-reading many, many times. 100 out of 5 stars. Remember a million years ago when I was going to talk about movie adaptations of books and the changes made to the source material and whether or not it worked and it was going to be great — and then I never did it again? I’m sure you were real broken up about that. But this week, before Jurassic World hits theaters, I wanted to talk about the movie (and book) that started it all, Jurassic Park. Jurassic Park is one of my favorite books of all time. Of. All. Time. It was my gateway into the world of science fiction. I’ve read it so many times my old mass-market paperback is falling apart. I love the movie too. But it’s totally different. Totally. Different. It’s one of those rare instances where completely altering the plot and characters from the original actually worked to the adaptation’s favor. And today, because I am seeing an advance screening of Jurassic World tonight and can think of little else, I want to talk about some of those differences, for better or for worse. No-one’s-favorite-character Donald Gennaro, the “blood-sucking lawyer” who panics and hides from a T-Rex in a rickety bathroom stall, actually makes it all the way through the book. Yes, Ian Malcolm dies and Gennaro lives, because in the book, life is unfair and chaos theory reigns supreme. In the book, Gennaro isn’t even present during the T-Rex attack, and another character (Ed Regis, who is not in the movie) runs off and dies instead. But for the purposes of film, having a T-Rex eat Gennaro by plucking him off a toilet established what the characters were up against in one massive chomp, and we didn’t even have to lose a character we liked to accomplish it. 4. John Hammond is Santa, so of course he lives. In the book, Hammond is not the kind, gentle, every-grandpa of the movie, but a greedy, manipulative old miser who learns absolutely nothing during the meltdown of the park, blames other people for everything that goes wrong, and in the end gets slowly nibbled to death by compys on a beach. Good riddance, book readers think when he dies. In the movie, John Hammond is misguided, sure, but we still love him. “So have I,” Hammond replies, jaw set as he drives the escape vehicle to the helicopter. Book!Hammond would never do this. He’d never admit he was wrong. It works in the book — which is about chaos and the hubris of man and the vast power of nature and the resiliency and resourcefulness of humans in desperate circumstances — but in the movie, which is about rampaging dinosaurs, there’s really no need for a human villain. In the book, Tim is both the older sibling and the computer nerd. Lex is his younger tomboy sister, and basically does nothing helpful the entire book. In the movie, they made her the older, tech-savvy sibling. She’s the one who gets the Park’s electrical systems back on line toward the end, she distracts a velociraptor from eating her little brother in the kitchen scene, and though Lex is probably not anyone’s favorite character, without her involvement, a few more beloved characters probably would have gotten eaten. 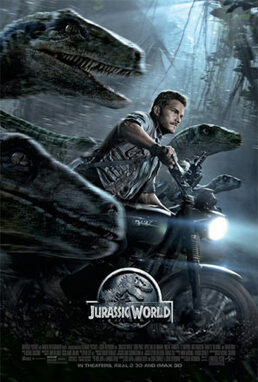 The movie is not at all concerned about all the pesky science in the book; it just wants to give us cool dino action. And it delivers. The T-Rex in the book is only ever a gigantic, menacing animal, but the T-Rex in the movie swoops in like Batman at the end to save our main quartet from raptors, and then roars triumphantly as the Jurassic Park banner flutters dramatically to the ground, and oh dear readers, it is glorious. Ian Malcolm’s injuries from the T-Rex bite are far worse in the book than in the movie, and just before the end, he succumbs to them and dies. This is then retconned in the opening pages of The Lost World, in one of the least-believable passages I have ever read in a Crichton novel — and Crichton books are about dinosaurs and aliens and time travel and homicidal gorillas — probably because Jeff Goldblum was popular and Hollywood wanted a sequel starring him. Which was…terrible. But, horrible sequels aside, for the sake of the movie, keeping Malcolm alive was a smart choice. It would’ve been a lot harder for the movie to have the optimistic ending it did if Jeff Goldblum had not been grinning on that helicopter. A big subplot from the book which the movie pretty much ignores is Alan Grant’s obsession with understanding how the raptors are reproducing and how far they’ve spread so that they can be sure they eradicate them all. Gennaro wants to blow the whole island up with a bomb, but Grant insists that first they must infiltrate a raptor nest and count eggs so they know how many raptors they’re dealing with. So Grant, Ellie, and Gennaro squeeze their way into an underground raptor den armed with a bunch of nerve-gas grenades, intending to do the count, then kill all the raptors. 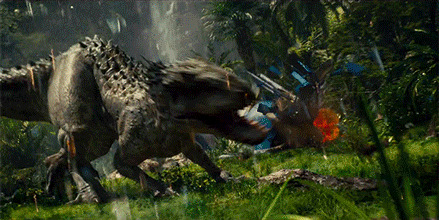 Before they can, all the raptors run away and they don’t wind up gassing them, but watching our main characters crawl into a nest and hide right under the noses of a den of raptors would have been pretty great. Having one of the park’s chief scientists along for the ride adds a ton of insight into the dinosaurs (in the movie, Grant picks up some of that slack, but a lot of Wu’s contributions are just omitted entirely), and really plays up the science aspect of this science-fiction story. However, keeping him out of harm’s way in the first movie — in the book, Wu is eaten by a raptor toward the end — has left the door open for him to be alive and kicking and still cloning dinosaurs twenty-two years later in Jurassic World. Huh. Maybe it’s not good that Wu survived, since he apparently learned nothing. At one point toward the end of the book, the kids and Gennaro get cornered by raptors, and Grant lures them away to the hatchery, where the dinosaur eggs are kept. He then injects the eggs with a lethal poison and rolls them down the hall to the raptors, where they eat them and then drop dead. It sounds dumb when I explain it like this, but in the book it’s extremely tense. Much like the kitchen scene in the movie (which I love and would like to keep — I just also want the egg-bowling scene). I think we’re learning by now that I really liked a lot of Grant scenes in the book that never made it into the movie. In the book, Grant, Tim, and Lex take a raft down the river (because Jurassic Park has a river) that takes them through the aviary, to the lodge. They are attacked by pterodactyls. They dodge the T-Rex again. They go over a waterfall. Alas, none of this is in the movie. And when we finally do get boats and pterodactyls in Jurassic movies, it’s awful. Oh well. At least we’ll always have The River Wild. Robert Muldoon is the only character who actually deserved to make it through this story. He is knowledgeable about dinosaurs, he respects them, he warns everyone time and time again about how dangerous they are, he understands how they hunt — and in the book, all this knowledge and respect and cunning is rewarded by him making it off the island. And while allowing for his death in the movie gives us one of its best lines, I will always wish that he had then promptly escaped by crawling through a pipe, as he does in the book. Also, my personal theory is that Jurassic World is the result of Hollywood realizing this, and deciding that not only should Muldoon have lived, but he should have been the main character, and then building a movie around it. No one can convince me that Chris Pratt is not just playing Robert Muldoon 2.0. I could keep going — there are a million and five changes between the book and the movie — but I think you get my point. Normally part of me cringes when a movie deviates significantly from its source material, but I’m still able to love Jurassic Park for what it is. It’s awe-inspiring and suspenseful, full of adventure and heroism and moments of humor and wonderfulness. Still, part of me is glad that Jurassic World is not based on a book, so that I won’t have anything in my head to compare it to (then I remember that Jurassic Park 3 was not based on a book and it was terrible, but shhhhhh I’m trying to block that out).